Access control is a good management tool which can tighten up your security and keep track of employees and visitors during the work day. Some businesses even use the card readers as a guard tour system printing out the daily rounds Access Control. We install magnetic stripe proximity readers and key tags systems. The A-Series family of keypads is designed to control access of a single entry point for facilities with up to 150 users. Each user is assigned personal identification Access Control number which can be three to six digits long. Audible feedback verifies each key press. All programming is easily accomplished from the keypad. The non-volatile EEPROM memory retains all programmed entry codes. Outputs #1 and #2 are Form C relay contacts. Output #3 is an open collector transistor. 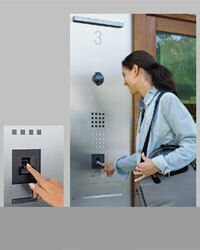 Authorized door open time can be programmed for Control any duration from 1 to 99 seconds. Three rugged stainless steel models are available to meet most residential and commercial environments. State-of-the-art access control that integrates the most advanced security technologies with innovative networking capabilities to bring you full-featured security solutions serving any size facility. We Designed, Access Systems, products provide you with the technology you need to deliver sophisticated security solutions, from the simplest to the most challenging. B-Net 91 20 Fingerprint. The unique biometric data in the employee’s fingerprint is recorded along with their personnel number and stored in the B-Net 91 20 Fingerprint terminals. Advantages of biometric identification methods – Because biometric traits are unique to each individual, they can be used to prevent theft or fraud. Unlike a password or PIN (personal identification number), a biometric trait cannot be forgotten, lost or stolen.